The Smurfs from 20001 to 20050 represent the earliest smurfs that were on the market! 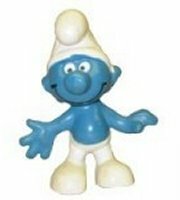 In 1965, Schleich, began to produce the PVC smurf collectible figures (the first 3 being Normal Smurf, Gold Smurf and Convict Smurf) and after that began to release new figures every year. New smurfs figures have been produced nearly every year after that and there are now over 400 different figures to collect. In 1965 Normal Smurf, Gold Smurf and Convict Smurf were produced and these were followed in the 1966 with Angry, Spy and Drummer. 1969 Smurfs were Shiver, Brainy, Lute, Papa and Astro. 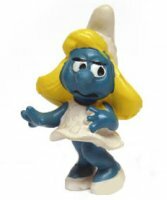 Smurfette first made her appearance in production in 1971. The same Smurfs were produced over many different years, but some smurfs were only made over a few short years... leading to higher values for some figures. Some of these Smurfs are nearly 50 years old! Money Smurf - Small Mould - Unpainted Eyes! Rare! Photo above shows painted eyes, not on this one though.